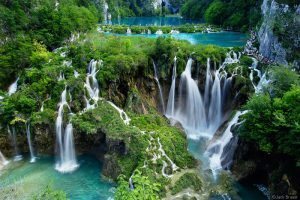 As the largest national park in Croatia and one of the oldest national parks in this part of Europe, Plitvice Lakes was added to the UNESCO World Heritage register in 1979. due to its exceptional natural value and preserved areas. The national park was founded in 1949 and is situated in the mountainous karst area of central Croatia, at the border to Bosnia and Herzegovina. The national park is world famous for its lakes arranged in cascades. Currently, 16 lakes can be seen from the surface. These lakes are a result of the confluence of several small rivers and subterranean karst rivers. The lakes are all interconnected and follow the water flow. They are separated by natural dams of travertine, which is deposited by the action of moss, algae, and bacteria. The particularly sensitive travertine barriers are the result of an interplay between water, air and plants.The lakes are renowned for their distinctive colors, ranging from azure to green, grey or blue. The colors change constantly depending on the quantity of minerals or organisms in the water and the angle of sunlight. The Legend of the Black Queen, the legend on “prošnja” (praying the black Queen for water) says that the inhabitants of this region were craving for water and thus called upon the magic queen to help them, which she did. According to the legend, this is the reason why Prošćansko jezero and the other lakes inside the park have emerged. Wooden paths accross the lakes with breathtaking views and the crush of magnificent waterfalls are the perfect setting for a day full with admiration to nature, so join our tour with experienced and knowledgeable tour guide and discover Plitvice Lakes national park.